Scientists will unveil what they are calling a "major discovery" in the field of astrophysics today (March 17) in a presentation at the Harvard-Smithsonian Center for Astrophysics (CfA). CfA officials did not detail the nature of the astrophysics discovery in a media alert. They only stated that the center will "host a press conference at 12:00 noon EDT (16:00 UTC) on Monday, March 17th, to announce a major discovery." Space.com will provide complete coverage of today's announcement. The Harvard-Smithsonian Center for Astrophysics is made up of the Harvard College Observatory and the Smithsonian Astrophysics Observatory. 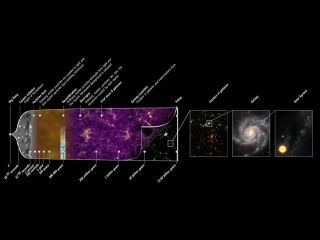 Scientists at the center pursue studies of those basic physical process that determine the nature and evolution of the universe," according to the CfA website's official description. The Harvard Observatory was founded in 1839 as a research arm of the university's astronomy department. The Smithsonian Astrophysics Observatory was founded in 1890. The two institutions merged 1973 to become a joint center for astrophysics research. "Today, some 300 Smithsonian and Harvard scientists cooperate in broad programs of astrophysical research supported by Federal appropriations and University funds as well as contracts and grants from government agencies," CfA officials explain in a description. "These scientific investigations, touching on almost all major topics in astronomy, are organized into the following divisions, scientific departments and service groups." Visit Space.com today at 12 p.m. ET (1600 GMT) for the results of the CfA announcement.